BicycleDutch’s post yesterday about his unexpected 55km cycling journey reminded me that I had also made an unplanned cycle trip in the Netherlands, due to a railway being out of action. Unlike his journey, however – which was long, and in the dark, and in the aftermath of a storm – mine was a good deal shorter, and took place on what turned out to be a glorious, hot, sunny day. Last summer, I was heading home from the VeloCity conference in Arnhem and Nijmegen. My initial plan was to cycle towards Arnhem on the fast cycle route from Nijmegen, and then spend the day cycling around in Utrecht and Rotterdam, before finally catching the train (with my bike) to the evening ferry crossing back to the UK. The initial part went to plan – I cycled towards Arnhem, before getting on a train at Elst (about two-thirds of the way between Nijmegen and Arnhem). This was a typically impressive new station, with a cycling underpass directly under the tracks (although I was a little bit surprised there was no walking-specific provision here). A change at Arnhem took me and my bike quickly to Utrecht, where I discovered a problem. All the trains to Hoek van Holland (where the ferry departs) were not running, because the train tracks were being dug up and replaced. As I saw for myself when I arrived, some time later. I hadn’t spotted this when I arrived in the Netherlands, because I had cycled directly off the ferry towards Rotterdam and Gouda. So I decided to change my plan, aborting my visit to Utrecht, and heading straight to Rotterdam, from where I could at least think about the best way of getting to the ferry terminal (either by cycling, or by public transport). Rotterdam Centraal station – and the area in front of it – is tremendously impressive, and I spent some time here taking photographs of the hordes of people cycling and walking to and from, and past, the station. The area is dominated by active travel and public transport, with the only sounds being conversation, the dinging bells of passing trams, and the occasional motor vehicle using the access road, some distance away. As I was doing this, and still musing about what to do, I spotted the standard Dutch cycling signposts beside the cycle path in the photograph above, which indicated that the city of Delft was only 15km away (about 9 miles). I’d never cycled between Rotterdam and Delft, but I had cycled between Delft and the ferry terminal many times, a journey of about fifteen miles. Adding the two together and I’d have a journey of about 24 miles, with the first part being completely unfamiliar. Without really knowing what I would encounter, and with the added problem of no data roaming on my phone – but trusting that the infrastructure would be of a good standard – I quickly decided to head off in a northwesterly direction, cycling towards Delft, straight under the railway station through the cycling and walking tunnel, under the platforms. This brought me out on the north side of the station, an area which has also undergone tremendous change. When I last visited these streets in 2011, the road here only had painted cycle lanes, but there was now a wide two-way cycleway, running beside the station, with a wide kerb and parking protecting you from traffic, and new trees that will offer shade and shelter. 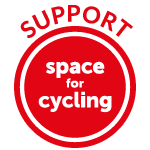 You can read more about how this area is changing – with improvements for cycling – on Mark’s blog. I followed this route as it wound northwards, with priority over side roads. A quick check of the signs at the next junction (remember, I had no real idea where I was going!) and I found myself on a low-traffic service road next to the main road. Although there are plenty of parked cars here – both accessing the supermarket on the right, and presumably belonging to residents – this felt very safe. My route then took my beside one of the main roads heading out of the city centre, towards the A20 motorway, which skirts Rotterdam. I encountered a woman riding a horse along the road here, in the suburbs of the city. As I cycled further and further out of Rotterdam, the environment became increasingly dominated by motor traffic, but the conditions for cycling remained entirely safe and attractive. A petrol station beside a major road was completely bypassed by the cycleway. I then came across an enormous ‘Spaghetti Junction’-style mess of roads and slip roads layered upon each other. This turned out to be where two motorways meet, the A20 and the A13 (which connects Rotterdam and Delft). Needless to say my passage through this area involved absolutely no interaction with motor traffic whatsoever – a network of cycleways passed under (and over) all these roads, and with clear signposting was a breeze to negotiate. This area was a vivid reminder that while the Netherlands does have high cycling levels, it also builds roads on a massive scale, with a dense motorway network connecting the major towns and cities. … before I emerged in a suburb of Rotterdam. Navigation would now be very easy, because I would be following the motorway (the A13) all the way to Delft. You can see that it is shielded behind noise barriers here, in an attempt to mitigate noise pollution. Although this was direct, and easy – cycling on a very low-traffic service road, next to the motorway – it quickly became quite boring. It was also pretty hot now, with the sun beating down, so I was quite relieved when two women on e-bikes overtook me. With a little bit of effort, I was able to get into their slipstream, and draft them all the way to the outskirts of Delft, some five miles away. If I had planned my route between the cities, instead of just heading out spontaneously, I’m sure there would have been more attractive routes available, rather than just plodding along beside the motorway – as safe as this was. Perhaps that’s something for the future. In any case I soon came across an underpass, back under the motorway, that I had used before in Delft. This path leads to Delft University, and from there it is only five minutes or so, right into the picturesque city centre, where I was able to cool off and get some refreshment! Here’s my map of the route – just under ten miles, from city centre to city centre. My trip may not have been anywhere near as hard as Mark’s (the weather was certainly far better, although perhaps a little too hot!) but it does demonstrate, in a similar way, that it is possible to spontaneously set off and cycle from one Dutch city to another with minimal planning, without worrying about traffic conditions or other difficulties. Jitensha Oni has kindly provided a template of the ‘cycling infrastructure types’ used on this trip. I made a spontaneous trip from Den Haag to Delft and onwards to Hoek a couple of years ago. Similar idea, really. Just followed signs. More recently we pootled from Hoek to Amsterdam via Zandvoort, which was probably a bit much, but great fun along the Noordzeeroute. It feels like such a privilege to be able to just roll off the boat and do that on a whim. I can’t wait to visit NL properly with bikes this spring, this sort of spontaneous trip looks so easy. I know that you are aware of a comparable journey in the U.K. (Horsham – Crawley) and how mind bogglingly awful that is in places, even if you can find signs to point the way! Riding next to one of Europe’s bussiest motorways can indeed be bit fumigating (I always **hate** that particular stretch of your journey). For future reference, there is a route only 200m West that follows the canal. It’s a gorgeous route and like travelling back 400 years in time through all the little villages. There also both routes slightly west and slightly east that take you through protected wet lands which are beautiful in the summer. I cycle this frequently as my partner lives in Vlaardingen, west of Rotterdam – we go a pretty route, can’t tell you which it is just follow our noses – via Schipluiden I think. We are about to do it again for the amazing Delft Blues Festival next weekend. The thing which the English cannot get their heads round is there is cycling which millions do age 4-94 and many many women of 60+ and there is London type cycling to work – a very different thing it is so depressing trying to explain to people that if they only have the right bike for comfort and ease they could enjoy this joyous activity. The recent news that encouraging people to do more exercise here isn’t working and a woman saying she doesn;t have time – well just get on a bike to go to the shops, to school etc etc.